Hayfield’s very own Emma Holst featured in an article in the Austin Daily Herald. Click here for the article. We are working in collaboration with the Minnesota Department of Education (MDE) to ascertain where school districts are with the impact of the inclement weather days from last week. You may have seen the following: “The governor has assured local school districts that they will not be penalized for keeping their students safe,” a spokesperson for Walz’s office said. If only it were that easy! After conversations with my Superintendent’s organization and MDE, the legislature would need to approve any modification to the state statute regarding days/hours of required time. So with that uncertainty in mind we are currently out of snow days as a district for the 18-19 school year calendar. In an effort to be proactive due to construction needs and the fact we can not add days to the end of the school year. We need to proactively add February 18th, 2019 (President’s Day) as a student/teacher day. This will be an E day for Secondary Students and Staff. Please be advised April 22, 2019 (Monday after Easter) may also need to be a school day (teacher and student). This will allow us to bank a snow day and possibly a second if needed. Any snow days that are not used will come off the end of the school year. If things work out and we are forgiven those 3 days from last week we will make adjustments to the calendar in May, such as getting students out of school earlier. Graduation will remain Friday May 24th, 2019. If there are issues or concerns about adding this day to your family schedule, due to plans you may already have, please contact the school and your student will be excused. The new cafeteria opened on Wednesday January 2nd and seems to be a big hit with the students. On Wednesday January 3rd Superintendent Gregg Slaathaug did a Facebook Live video and interviewed a number of students. Click here to watch the video. Click here to check out the most recent Facebook Live video report of the construction progress by Superintendent Gregg Slaathaug. As part of Kindness Week students were encouraged to participate in acts of kindness. As you can see our Kindness Bingo Board has filled in nicely. Many of the students have enjoyed receiving and giving small acts of kindness. Keep spreading kindness like confetti! Jeff Foster donated time and service to remove flag and put back up after painting and sandblasting. Thank you very much for your assistance. Construction has begun on the exterior of Hayfield High School. 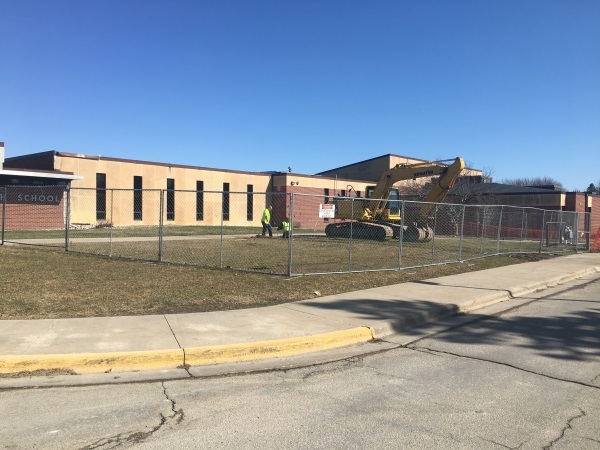 The Facade is being removed, the front bollard lighting is being taken out, the sidewalk and topsoil in the new cafeteria are being removed and the footing for the new cafeteria will be dug later today. Head on over to our District Facebook page for pictures and videos of the construction process. The 24th annual traveling art show will be held in Hayfield High School’s Library on Thursday, February 15th through Friday, February 23rd. The show exhibits work from grades kindergarten through twelfth with a variety of media being used. When you come to the show, you will see artwork from some very talented young students from around the surrounding area as well as artwork from seven talented Hayfield students. Entered this year from the high school is seventh grader, Karson Steele with his colored pencil drawing of a tortoise in “Four Animal Views”. Two freshman artists with their scratchboard drawings include Allie Tufte with “Tranquility” and Joseph Tempel’s “Midnight Migration”. Juniors in the show are Matti Morris with her colored pencil drawing of a lily pad turning into a cupcake called “Transformation” and Alyssa LaPlant’s postage stamp design called “New York”. The final two artists from Hayfield are seniors Zachary Nelson with his “Muhammad Ali” graphite drawing and Steven Miner’s “Chance” mixed media drawing. On behalf of the seven artists entered into the traveling art show this year and the Hayfield Art Department, we hope to see you at the show! Not pictured is Alyssa LaPlant, The single artwork named “New York” is hers. We have unfortunate news to share about a Hayfield Community Elementary student’s family. The family of three (and a dog) are safe, but they lost their home and their personal belongings this morning in a fire. The community is providing a place to sleep and food for the family the next few days. You are welcome to assist the family this next week. You can bring cash donations to the elementary office through next Friday, January 19. Material items are not appropriate at this time, because they do not have a place to store these items. If you have an interest in providing material donations in the near future, please leave your name and phone number with Tanya in the elementary office. The Hayfield Lady Vikings basketball team traveled to Minnetonka High School to take part in the Breakdown Invitational Showcase on Saturday. There were 16 varsity games played at Minnetonka on this day. Hayfield’s opponent was Mayer Lutheran, which is a very athletic team, that won the class A title in volleyball this fall. The game started poorly for Hayfield as they feel behind 7-2. The Lady Vikes started to warm up and a couple Maggie Streightiff 3 pointers had Hayfield right back in the game. Slowly, but surly, Hayfield built a ten point lead with about four minutes left in the first half. The Crusaders then made a nice run to cut the lead to one. Olivia Matti gave Hayfield a little cushion going into halftime as she made two three pointers in the final minute of the first half. The halftime score was 31-25. The Lady Vikes started the second half with three straight steals and baskets to put the lead up to double digits and the lead never went back to single digits the rest of the game. The lead got as big as 22 in the second half for Hayfield and the Lady Vikes cruised to a 66-51 victory. Scoring: Olivia Matti 19, Maggie Streightiff 16, Carrie Rutledge 13, Kate Kruger 8, Elecia Brown 6, and Abby Stasko 4. Next up for the Lady Vikings is a trip to Pine Island on Tuesday night. Congratulations to Maggie Streightiff, signing to play volleyball at Upper Iowa. Her father Doug is with her in the picture. Way to go Maggie. The following students were selected to perform with the 2017 Stewartville Junior High Honor Band as part of the 2nd Annual Stewartville Fall Band Festival. 7th and 8th grade Students from over 10 area Schools made up the Honor Band. They were directed by retired Band Director, Dave Gudmasted from Winona, Minnesota. Students rehearsed all morning and afternoon Saturday, November 4th, performing on the Stage at Stewartville at 4:30. Congratulations to the following students; Josanne Tempel, Alto Saxophone; Giovanna Galdamez, Trumpet; Anabelle Bamlet, Clarinet; Alexis Roe, Flute; McKenna O’Connor, Trumpet; Isaac Beck, Trumpet, Reese Bauman, Alto Saxophone and Dakota Robinson, Tuba. Congratulations to Olivia Matti, Dylan Monahan, Carson Anderson, Steven Miner, Mason Nitz, Alexis Dudycha, Miranda Steinfadt & Bailey Lubbert for being a part of the HVL all-conference honor choir. At Stewartville High School, on Monday evening, they performed under the direction of Luther College director Mark Potvin. Fantasic job! Today is an important day — National Custodian Day! Please take a few minutes and thank our dedicated custodial team. We are lucky to have you here at Hayfield Community Schools! Thank you for all that you do! Hayfield Community Schools is featured in the Austin Daily Herald for their charitable contributions to assist students affect by Hurricane Harvey. Click here to read the article. Click here to read the awesome article on two of Hayfield’s seniors Carrie Rutledge and Maggie Streightiff. Great records girls, the numbers will just keep climbing. Way to go Carney Sisters!! As many of you know Jacob Reynolds (class of 2018) undertook a huge project for his Eagle Scout project this year. His project was to raise enough money to fund the installation of a new full color, digital, informational sign in front of Hayfield Community Schools. He has worked tirelessly on this project and the final result is absolutely amazing. Thank you Jacob for all of your efforts, the sign is wonderful and we are so proud to have you as a student here at Hayfield High School. Great article in the Austin Daily Hearld about the Hayfield Viking Softball team. Go Vikings!! Click here to read. Very nice write-up on Hayfield’s Katrina Thoe. Click here for more info. Congratulations to the following ST. COUNCIL MEMBERS for the 2017-18 year. Hayfield High School Track & Field athletes advancing onto Sections are Maryx Young (1600), Hannah Tempel (4×2), Lila Gronseth (4×2, shot, disc), Kalli Jo Klocke (PV), Katrina Thoe (shot, disc), Abby Stasko (4×2), Alexandra Louks (4×2), Steven Miner (200, 4×2, HJ, TJ), Masen Walsh (4×2, LJ), Steele Tebay (4×2), Trey Chatman (disc), and not pictured, Alex Heins (4×2). Congratulations to you all and good luck next week at Sections in Elgin! Teacher of the Month: Mark Carlson, of Hayfield Elementary, to read story in the Post Bulletin Click here. Trace Tebay signing to play basketball at Gustavus next year. Pictured with him are his parents Angie and Jason Tebay and AD/Head BBB Coach Chris Pack. Lane Canny signing to play football at RCTC next year. Pictured with him are his mother Tammy Canny, Head Football Coach Adam Schroeder, and AD Chris Pack. On Monday April 3rd, six students traveled to Wabasha-Kellogg High School for the sub-section 1A-1 speech tournament. The relatively inexperienced team competed well, with sophomore Anikka Bjornson earning a place as alternate to the section tournament in Creative Expression and junior Tucker Cordle advancing to sections with a second-place finish in Discussion. Teammates Dylan Monahan (Drama Interpretation), Kelsey Roe (Creative Expression), Hannah Breault (Creative Expression), and Paetyn Stadler (Discussion) also competed well at their final tournament of the season. Coaches Brandon Greenfield and Laura Hoebing are proud of the team’s growth and successes this year and look forward to growing the team with these student leaders next year! Tucker will compete at the section 1A tournament in Byron on Saturday, April 8. The Hayfield baseball team recently completed their trip to Florida for spring training. The team left on March 23rd and returned on March 28th. They were able to get in six varsity scrimmages, three JV scrimmages, and two practices while on the trip. They stayed at the International Palms Resort which is right on the ocean and provided nice amenities. The team was also able to experience Fun Spot America Amusement Park and Disney Springs as part of the trip. Twenty-two players in 9th-12th grade were able to experience this great trip and make lifelong memories along the way! A number of Hayfield High School students have had the opportunity to learn to dance in Mr. Dicks Phy Ed class. With the assistance of Mary Peterson the students are learning the moves. Please click here to visit our Facebook page to view the videos. Today, the High School Choir & Band participated in the MSHSL Large Group Contest at Stewartville High School. Both ensembles received the highest rating of superior. Congrats to both the band & choir for their fantastic performances!! Congratulations to these five students for representing Hayfield at the South East Minnesota Middle School Honor Band. These students performed with over 100 students from over 30 other schools under the direction of Dr. Steven B. Thompson, director of bands at Bethel University in St. Paul. They began rehearsing at 9:00 AM and performed a concert in Knowlton Auditorium at Austin High School at 5:00 PM. Their selections were; “A March on the King’s Highway” by Pierre La Plante, “First Light on the Chesapeake” by James Hosay, “Onward” by Gary Gilroy and “The Incredibles” by Michael Giacchino. Their day long hard work paid off in an outstanding performance that evening. Lucas Brennan (Tuba), Grace Becker (Alto Sax), Isaiah Tempel (Trumpet), Kylie Zubke (Clarinet) and Allie Tufte (Flute). Section semifinal Girls Basket Ball vs. Rochester Lourdes, 2:00 at Mayo Civic Center Auditorium. Come support our Ladies! The #2 seeded Lady Vikes opened up playoffs at home on Thursday night vs. #15 seed Triton. The game was close for the first few minutes as teams traded early buckets, but Hayfield went on a big run from their and put up 61 first half points to take a commanding 61-18 lead into halftime. The second half went quickly as the running time mercy rule went into effect. Hayfield won by a final score of 96-36. Five different Viking players scored in double figures on the night. Next up is #10 seed Zumbrota-Mazeppa who pulled off the upset over #7 seed Dover-Eyota. That game is Monday, February 27th in Rochester at the Mayo Civic Center Arena. Game time is 6:00pm. Let’s turn the Civic Center Blue & Gold, wear you Viking gear and come support our Lady Vikes!! The Westfield Razorbacks (combined Hayfield & Blooming Prairie) have an AWESOME day. This brand new team will be sending 5 team members to the State Individual Wrestling Tournament. Congratulations go out to Colton Krell, Morgen Moreno, Mitchell Oswald, Trey Chatman, Ethan Arett. Way to go Razorbacks!! HVL Blue Division Champion T-Shirts. The Hayfield Lady Vikes traveled to Kenyon-Wanamingo on Tuesday with a chance to do something that only one other Hayfield girls basketball team has ever done, and that is win a division title in the always tough HVL conference. The game started well for Hayfield as they opened up an early ten point lead 14-4. KW was able to chip away at the lead the rest of the first half, but Hayfield still led at halftime 32-28. The second half started well for the Vikings and soon their lead was double digits. The lead got as big as 20 points and then the Knights made one last comeback push. KW was able to get as close as 7 points in the last few minutes but Hayfield shot well from the free throw line down the stretch and held on to win 66-58. Scoring for Hayfield: Maggie Streightiff 25 (6 three pointers), Olivia Matt 22 (5 three pointers), Carrie Rutledge 10, Kate Kruger 4, Sophia Waldner 3, and Elecia Brown 2. The win gives Hayfield the HVL Blue Division title and a spot in the HVL Championship game. That game takes place on Monday, February 20th at Kasson-Mantorville. Game time is 7:00pm. The Lady Vikes do have one game left in their regular season and that is a home game this Thursday vs Cannon Falls. It will be senior night. On a side note, Kenyon-Wanamingo star Mara Quam scored 32 points in the game last night, including her 2,000th career point, and we want to congratulate her on that amazing accomplishment! The Hayfield Community School District is thanking Karla Anderson for all her years of service as the Hayfield High School Secretary. Her pleasant smile and joyful welcome has greeted hundreds of students and families. Thank you for being a part of our team and HAPPY RETIREMENT to you. Our very own Mark Carlson was featured in a recent Post Bulletin article. Way to go Mark. We are proud to have you here at Hayfield Community Schools. Click here for the article. It has been a very busy time here at Hayfield Community Schools and we are posting quite a few pictures of the recent activities. Just a reminder, that with most of the pictures that are posted on the Current News and the Archived News sections of the website, if you click on the picture it will bring up a larger version of that picture. As many of you may be aware, one of our district families experienced a fire in their home late Monday night. They were able to get out of the house, but they will need our help. Clothing can be dropped off at 914 3rd Avenue SE in Hayfield. They will need sizes 5T and 14-16 for the two boys & the mother needs 2XL clothing..
Monetary donations may be dropped off at the Citizens State Bank in Hayfield where an account has been set up to help the family or at any of the Hayfield School district offices. The district will take any donations to the bank. Checks can be made out to the Michelle Miller Fire Fund. One of the greatest benefits of being in our small school district is the generosity of our students, families, and communities. Thank you on behalf of the family. The link below leads to a document describing the Concurrent Enrollment classes our Juniors and Seniors can earn next year while attending Hayfield High School. We have talked about this earlier this year. Thank you for your patience, as our staff has worked to be approved to offer these courses on our campus. Students will receive a master schedule for next year this week. You will find these courses listed on the master schedule. Many of you will be anxious to get more information. Mrs. Connelly will meet with each grade level to clarify and answer questions. Everything will be clear before you register for the 2015-2016 school year. Click here for Concurrent Enrollment Document.